Emily is currently a freelance journalist, writing stories about interesting people, places, and issues for a variety of publications. She started her career as a local journalist in the Greater Boston Area, reporting for eight different newspapers including the Boston Globe. During that time, she wrote about crime, gentrification, public transportation, budgets, and education. She interviewed politicians such as Elizabeth Warren and reported on breaking news stories such as the 2013 manhunt for the Boston Marathon bombing suspects. As a freelancer, Emily has reported on stories in Germany, England, Iceland, Mexico and South Korea. How do millennial Catholic-reared women relate to their religion? Emily explored her own complicated relationship with Catholicism, magical thinking, anxiety, and ritual, as well as her relationship with her beloved Catholic grandmother, in this personal essay for Slate, June 25, 2018. Porcfest is an annual gathering of New Hampshire libertarians, billed as the libertarian Burning Man of the East, with bitcoin. In 2017, Emily attended this festival to meet the people who would transform her home state into a free-market utopia, and wrote about it for The Baffler, May 17, 2018. 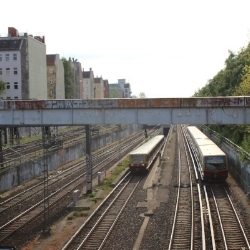 On the day Emily interviewed Irmela Mensah-Schramm for the Financial Times, Irmela, and Emily with her, nearly got arrested after an altercation with an angry right-winger on the outskirts of Berlin. Emily wrote about the experience in an essay for Off Assignment, April 12, 2018. How does Iceland's last tannery keep itself afloat? By turning discarded fish skins from the food industry into high-fashion leather. Emily visited the tannery on the Winter Solstice 2017, and wrote about it for Atlas Obscura, March 12, 2018. 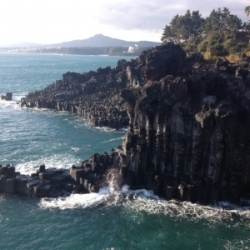 On the island of Jeju, South Korea, women have traditionally earned a living by free-diving into the ocean to gather abalone, sea cucumber, conches and other treasures from the ocean floor. Emily wrote about one of the youngest of these divers for Roads & Kingdoms, April 6, 2017; the article was listed on The Atlantic's The Week in Global-Affairs Writing, April 9, 2017. Mexico consumes more Coca-Cola than almost any other nation in the world. But what if there were an alternative? A couple in the Zapotec village of Santa Ana Zegache in Oaxaca, is making one. They call it Zega-Cola, and they hope it will keep jobs and money in their region. Emily visited them in March 2018 and wrote about it for NPR's food blog, The Salt, March 21, 2018. 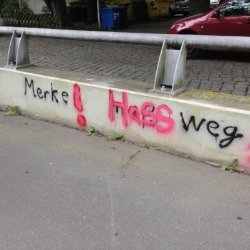 Irmela Mensah-Schramm is a 70-year-old German woman who has spent the last 30 years traveling around her country removing right-wing and racist graffiti, an activity that's often led her to run-ins with police and neo-Nazis. Emily spent a day with her in May 2016, and wrote about it for the Financial Times, August 20, 2016. Loren Coleman has spent his career hunting down cryptids: that is, Bigfoot, the Loch Ness monster, the yeti, and other creatures unknown to science. 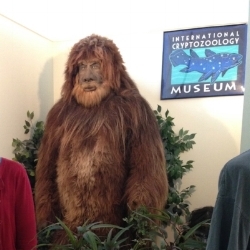 He's one of the world's best-known cryptozoologists, and he runs the International Cryptozoology Museum in Portland, Maine. Read Emily's account of his life and career in the Financial Times, March 10, 2017. Halé Sofia Schatz, a resident of Lexington, Massachusetts, has a slightly unusual hobby: raising goats in her suburban backyard. 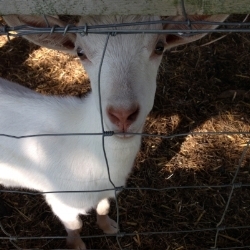 Emily visited her house and interviewed her about what it's like to be a goat mom in the suburbs, and wrote about it for the Boston Globe, August 7, 2014. The Isabella Stewart Gardner Museum art heist was one of the largest, most notorious art heists ever. This 1990 crime remains unsolved to this day. In July 2010, Emily interviewed Geoffrey Kelly, the Boston FBI agent responsible for leading his agency's hunt to recover the paintings. The interview appeared in the FT on July 16, 2010. When did the first charlatan forge a photograph? Emily answered this question in her contribution to the FT's Defining Moment column, in which she details the history of the invention of paranormal photography. The piece appeared on April 23, 2010. Every day, the town of Arlington, Massachusetts received a phone call about elder abuse. So they decided to do something about it. Emily wrote an article about the task force they created to combat this pervasive problem, June 5, 2014. The workers at the nursing home didn't want to quit: they felt a sense of obligation to the residents they'd been caring for for years. So they went on strike. Emily wrote about this walk-out at a Lexington nursing home for the Globe, May 11, 2014. How can a community farm impact a suburban community? Emily wrote about the town of Lexington, Massachusetts' new community farm and how this institution was educating students and adults alike about farming and food sustainability, November 28, 2013. In Radio Free Vermont, author Bill McKibben spins a fable about Vermont seceding from the United States. Emily's review appeared on Nov. 29, 2017. In How the Post Office Created America, Winifred Gallagher argues that the post office was integral to the development of American culture and history. Review on August 10, 2016. Ostend tells the story of a Belgian seaside town and the artists and writers who lived there in the calm before the storm of World War 2. Review on January 27, 2016. In Ten Million Aliens, author Simon Barnes sets out to prove that humans are not unique in the animal kingdom through a series of sketches describing the wildest and weirdest creatures on this planet. Review on February 26, 2015. What was it really like to grow up behind the Iron Curtain? In Born in the GDR, author Hester Vaizey interviews eight residents of this former country, presenting a nuanced portrait of life in East Germany in those decades. Review on January 7, 2015. In Deep, James Nestor explores the connection between humanity and the ocean by telling the story of the world's free divers: people who dive to the ocean's depths without oxygen tanks. Review on July 24, 2014. The Age of Radiance: The Epic Rise and Dramatic Fall of the Atomic Era explores the history of atomic power, from early discoveries by Marie Curie through the present day. Review on March 25, 2014. Storm Kings: The Untold History of America’s First Tornado Chasers tells the story of early storm chasers in the uncharted American West, and the development of weather research and prediction as we know it today. Review on March 5, 2013. Darwin’s Ghosts: The Secret History of Evolution tells the tale of the scientists whose discoveries helped propel Darwin to his theory of natural selection. Review on June 12, 2012.